When two actors with a history are thrown together as romantic leads in a forgotten 1930s melodrama, they quickly lose touch with reality as the story onstage follows them offstage. 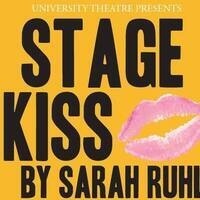 Stage Kiss captures Sarah Ruhl’s singular voice. It is a charming tale about what happens when lovers share a stage kiss—or when actors share a real one. University of Oregon Students get in to UT shows FREE! Come to the Miller Theatre Complex by 7:00p.m. (1pm on the Sunday show) on the night of the performance. Bring your valid UO ID and be prepared to have your hand stamped. ID validity at the discretion of box office staff. Be there early, seating is limited.